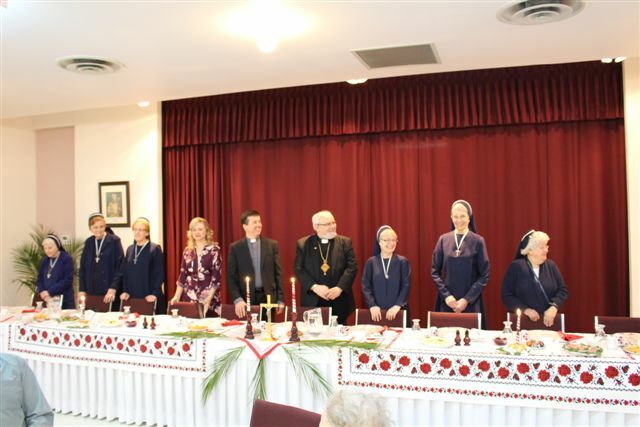 On Sunday April 10, 2016, a special Divine Liturgy and official closure of the Sister Servants of Mary Immaculate Mission in Dauphin was celebrated by His Grace, Metropolitan Lawrence Huculak and the Very Reverend Father Oleg Bodnarski. It was a nostalgic event of the closure of the mission after St Paul’s home was officially transferred to the Regional Health Authority on December 30, 2015. This mission had its humble beginnings with the arrival of two Sisters on August 22, 1928, and continued until the end of last year. 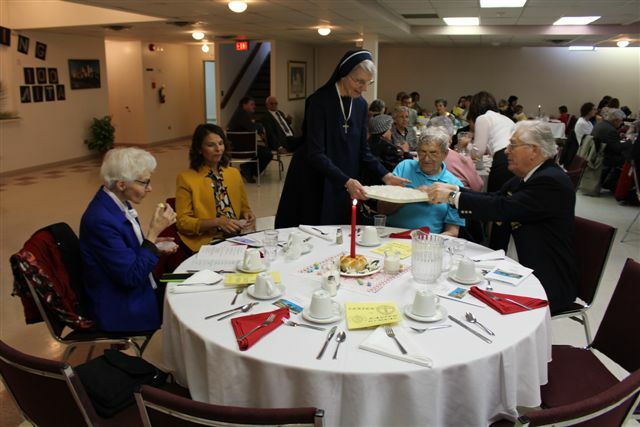 Provincial Superior Sister Patricia Lacey from Toronto and Sister Jean Zemliak, the last official Administrator of the Home, attended. Other Sisters in attendance were: Sister Ann Pidskalny, Sister Jan Soluk and Sister Joanne Zawlicki of Winnipeg and Sister Nestor Kyba of Yorkton. 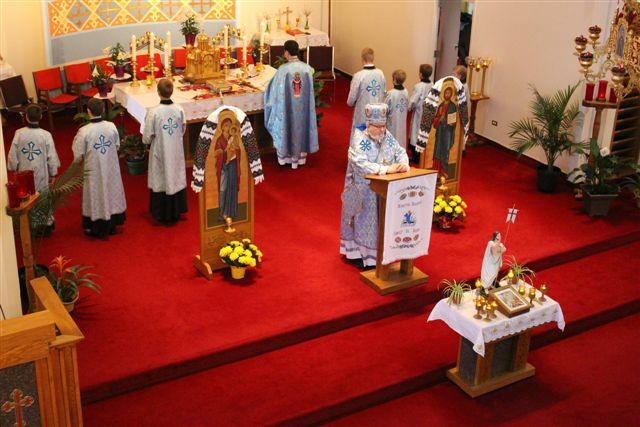 After the Divine Liturgy, all attended the banquet sponsored by the Ukrainian Catholic Women’s League. Mr. Ernie Sirski and Mr. Tere Stykalo were Masters of Ceremony for the banquet. Marlee Hadway and Nicholas Plustwa presented roses to His Grace and to Sister Jean respectively. Owen Tyschinski read the informative history of St. Paul’s Home. Mayor Eric Erwin brought greetings and words of thanksgiving on behalf of the city for all the years of service in Dauphin and the surrounding community by the SSMI. Deputy Reeve of the RM of Dauphin, Ron Ryz, conveyed thanks to the SSMI for their contribution through the years. Sister Superior Patricia Lacey spoke on the legacy left behind by the Sisters and encouraged those present that we carry on this legacy and open our hearts to those in need. Mr.Al Dowhan, past and last chairman of St. Paul’s Home, reflected on the early days and trials to keep the Mission going. He went on to say that the Sisters “established a high standard of care for the sick and elderly” in our community. Mr.Dowhan spoke briefly on the years of negotiations for the sale of the Home and his appreciation of Sister Jean’s administrative style, her energy, enthusiasm, knowledge, and determination in all she did. Father Oleg thanked Sister Jean for her work not only with the Mission but for her close work with the catechism program and the church in general. 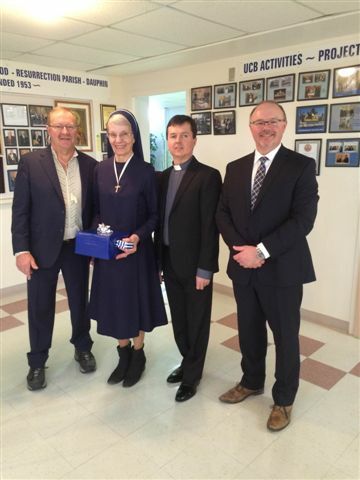 He and Parish Council Chairman, Ernie Sirski, presented Sister Jean with a farewell gift from the Parish to show their appreciation for her work with the Parish. Sister Jean thanked everyone for their kindness and support through the years and encouraged those present to “keep working for God and to represent God in their lives.” She concluded by saying that changes such as this one are not easy but change is inevitable and we need to accept it and move on.